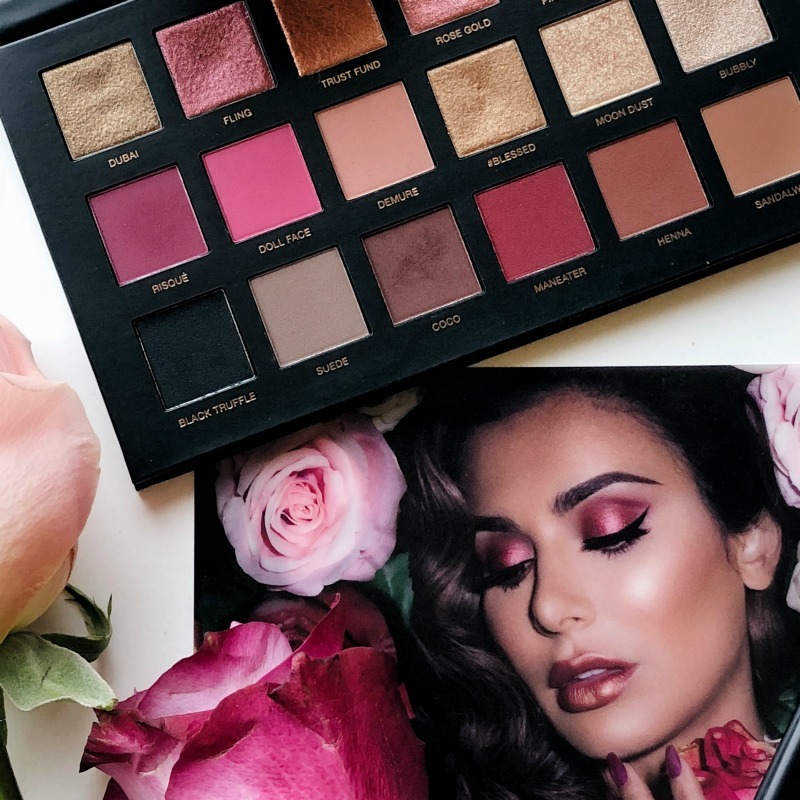 The Huda Beauty DESERT DUSK palette is one of my favorite eye shadow palettes, but sadly, I never got the much-loved Rose Gold palette before its surprising retirement. So when I heard that it was being re-released as the ROSE GOLD REMASTERED palette, I knew I couldn’t pass it up. 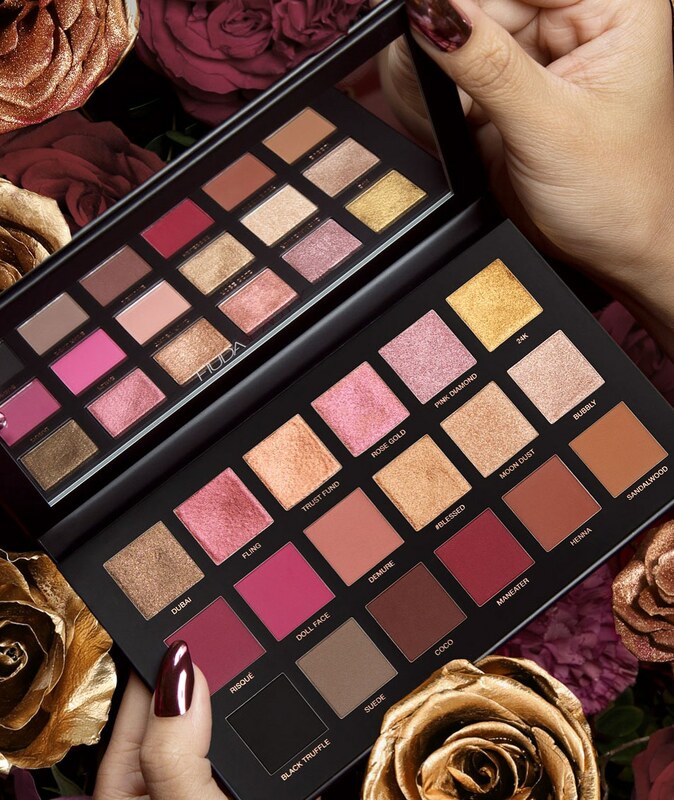 Priced at $65, the palette features 18 shadows including eight buttery mattes, eight melted metal shadows, one black shadow that can be used wet or dry, and one Pressed Pearls shadow. 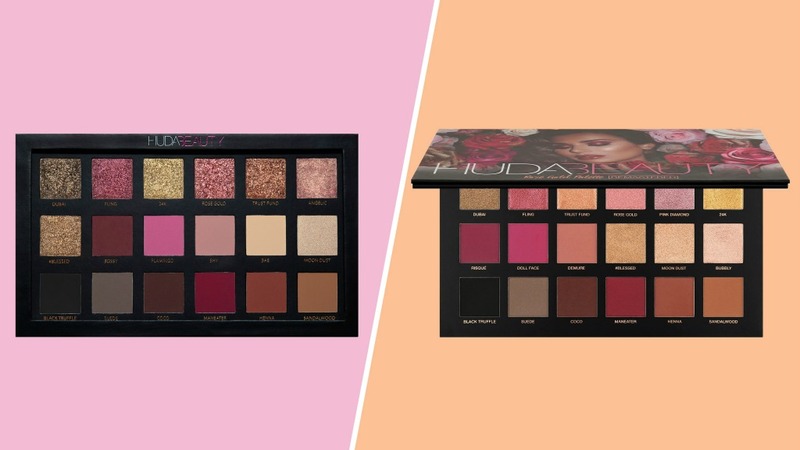 While this is an updated version of the palette, we do see some differences between the two. Upgraded packaging with a thicker casing and full-size mirror. 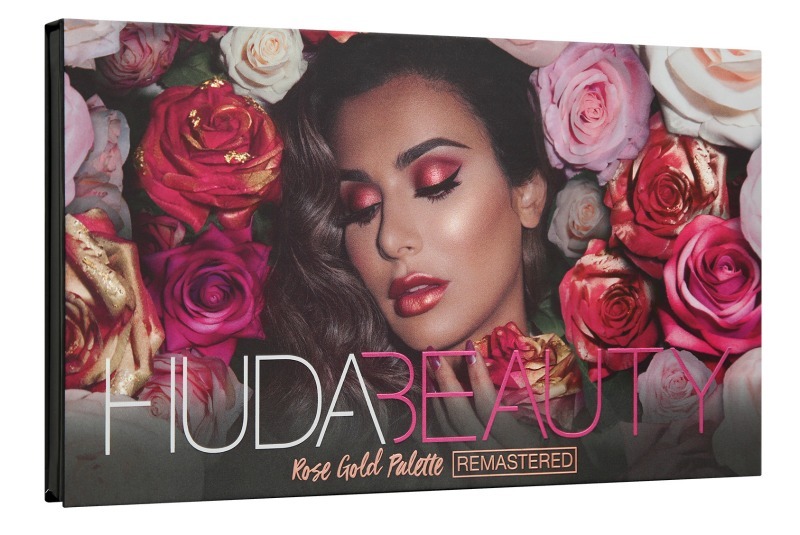 The see-through cover has been replaced with a stunning photo of Huda surrounded by roses. Better formulas, all of them soft and buttery, with less fall out as compared to its predecessor. You can also apply with a brush or your fingers. New shades Pink Diamond, Bubbly, Risqué, Demure and Doll Face are in; out are Angelic, Bae, Bossy, Shy and Flamingo. The shadows have also been moved around the palette itself. We get a blacker black with Black Truffle, which you can use wet or dry; a great option for eye liner. I’ve been using it pretty consistently for the past week and I’ve been very happy with every aspect. The shadows are truly soooo buttery soft, creamy and without much fallout. I learned that the reason the formula is so different is that the shadows are “back-injected” then baked, which is why they look like they are indented in the middle. You may even see the shadow move around within its place, and that’s okay, you can just press it back in. I’ve been obsessed with the mattes—the whole bottom row is my jam. The shimmers (melted metals and a pressed pearl) are beautiful too. After testing their application with a dry brush, wet brush and fingers, I found that I prefer to use my finger to apply, preferably a little wet. The pigment is strong and they blend well together. I love Bubbly and Moon Dust for inner corner highlight. Other favorites include Coco, Pink Diamond (prettiest pink shimmer) and Rose Gold. I totally dig the combo of Risque and Fling too. So is it worth the $65, I would say yes. I think it’s a versatile palette with fantastic formulas. I’ve used a light hand with the shadows for a more natural wear-to-work look and have amped it easily, layering on the pigment. It’s definitely a great go-to palette for those of us who love some shimmer on the lid too, because those colors are GORGEOUS on. You can buy ROSE GOLD REMASTERED online at Sephora, Cult Beauty and shophudabeauty.com. It seems to be sold out at Sephora and Huda Beauty, but I was able to find it in stock at SELFRIDGES. You can find it in store at Sephora in July. 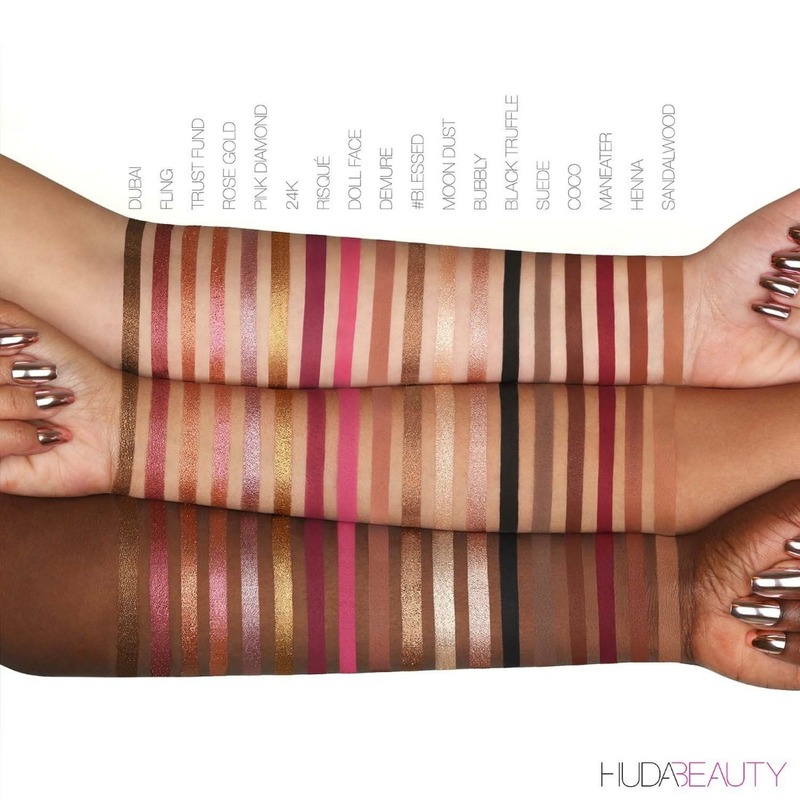 Photos courtesy of Huda Beauty.